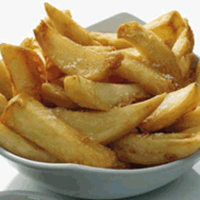 Heston Blumenthal's famous triple-cooked chips, served at the Riverside Brasserie in Bray, are widely celebrated. His thrice-cooking method means that the fat, finger-sized chips have golden, crisp exteriors and insides that are light-as-a-feather fluffy, like a down pillow. The contrast of the two textures is so good that it's hard to feel too guilty about indulging. Our take on Heston's chip recipe also incorporates one of the best-kept secrets of chip-making: to make them extra crispy on the outside, chill them before frying. Place the chipped potatoes in a large pan of cold water and soak for half an hour. This removes excess starch, giving the chips a lighter texture. Rinse and place the chips in a pan with cold water and the sea salt. Bring to the boil and cook for 10–12 minutes, or until you can insert a knife easily through the centre of the largest chip. Drain and run the chips under very cold water to prevent further cooking. Pat dry with kitchen towel and arrange on a baking tray lined with greaseproof paper. Place the tray in the freezer for 30 minutes. This will make the chips nice and cold before you drop them into the hot oil to fry. Fill a saucepan a third full of oil (about 1 litre) and heat it to 130°C. Remove the chips from the freezer, pat dry with kitchen towel and carefully lower into the hot oil in batches of 8–10, cooking for 4–6 minutes, until they start to colour. Drain and continue cooking the remaining chips before cooling them in the freezer for another 30 minutes. Alternatively, prepare up to this stage a day in advance and leave them to cool overnight. For the final cooking, heat the same oil to 180°C and again, lower small batches into it. Cook for 2–3 minutes or until crisp and golden. As they come out of the fryer, drain on kitchen paper and give each batch of chips a good sprinkling of sea salt. Serve with ketchup and eat while hot.